The National Museum of the United States Army provides the only comprehensive portrayal of Army history and traditions through the eyes of the American Soldier. Through preserving, interpreting, and exhibiting invaluable artifacts, the National Army Museum creates learning opportunities for all visitors and bonds the American people to their oldest military service. We are America’s Army Museum. The National Museum of the United States Army will serve as the capstone of the Army Museum Enterprise and provide the comprehensive portrayal of Army History and traditions. Although the U.S. Army is the nation's oldest service, it is the only service without a national museum. The National Army Museum will honor United States Soldiers--past, present, and future--and provide an interactive educational experience illustrating the Army's role in creating and defending our nation, and highlight the Army's social initiatives and contributions for over 240 years. The Museum is located on 84 acres at Fort Belvoir, Va., conveniently located near historic Mount Vernon and less than 30 minutes south of our nation's capital in Washington, D.C. The main building will be approximately 185,000 square feet. There are three main galleries: Soldiers' Stories, Fighting for the Nation, and Army Society. 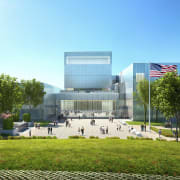 The Museum will also include an Experiential Learning Center, Medal of honor Experience and a rotating exhibit gallery. Future exterior elements will include an Amphitheater, Memorial Garden, Army Trail, and an outdoor event space. Use this link to volunteer today! Would you recommend National Museum of the United States Army?